What a world, that the pythons have chosen to dance in the streets of Biafraland and in houses instead of the hallowed almighty sambisa forest or every other forests in the Northern Nigeria where they are indisputably needed. The Nigerian government led by dictator Muhammadu Buhari, in the past few days released and launched their pythons to devour the indigenous owners of Biafraland who are peacefully exercising their rights to self determination. The ill-fated python dance was unleashed on the people of the Eastern region to intimidate the agitators into either resorting to armed struggle or into submission to jettison the quest for Biafra restoration. 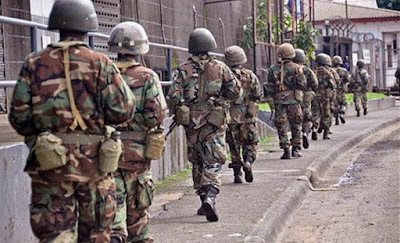 It is now a known phenomenon, the despicable and calculated act of terrorism being metted on Biafrans by the Nigerian military in the guise of code-named "OPERATION PYTHON DANCE II". It is worthy of note that the said operation has left no fewer than sixty peaceful Biafra activists dead, leaving scores with several degree of life threatening injuries in some parts of Biafraland. Meanwhile, the Nigerian military have also embarked on secret abduction, forceful disappearance and mass arrest of the Biafran youths and subjecting them to all manner of torture, inhumane and degrading treatments. It is expedient to notify the world that within the last few days not less than 300 Biafrans have been decleared missing by their respective families and their whereabouts remained unknown. The Nigerian forces also invaded the home of the IPOB leader, Mazi Nnamdi Kanu, killing scores of unarmed civilians, destroyed and looted a lot of valuables materials in his home and left dozens of others injured. However, after the illegal invasion of Nnamdi Kanu's residence in Umuahia, Abia state his whereabouts is still unknown as reported by his legal counsel and other family members. But I can tell you for free, that despite all the provocation, maiming and killing of the Biafran people under the able leadership of Mazi Nnamdi Kanu by the Nigerian military, the Indigenous People Of Biafra (IPOB) has remained peaceful and non-violent. Similarly, the aftermath of that invasion by the Nigerian Army, was shameless tagging of IPOB a terrorist group of which it is not within the jurisdiction of the Nigerian Army and it is beyond it's constitutional powers to declare any association or group a "terrorist organization". And that was a calculated attempt to have enough reasons to completely annihilate defenseless Biafran people. 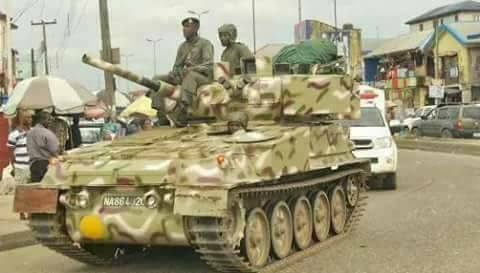 Is it not shameful, disgraceful and hypocritical that while Bokoharam terrorist sect is busy ravaging the North, and it's leader Abubakar Shakau daring Nigerian Army to engage him in combat in sambisa forest, the Nigeria Military is busy running Eastwards and rolling out armored tanks against hapless Biafran civilian population in the name of the dancing pythons? What a shame! We are hereby calling on the international communities and people of good conscience around the world, to as a matter of urgency intervene in the case of Biafra and condemn the illegality of the state sponsored killing and terror attacks on law abiding and defenceless Biafran population. Self determination is not a crime but an inalienable right of all indigenous people as enshrined in the United Nations charter. Moreover, a call for Referendum is not a call for War and Biafrans cannot run away from their land or allow the islamic fundamentalists from Northern Nigeria to completely islamize Biafrans with the force of guns and bullets hence, the urgent need to save Biafrans who are predominantly Christians inhabiting in the southern part of Nigeria, known as Biafraland. ZOO ARMY & THEIR HAUSA/FULANI PEOPLE ARE BUNCH OF LIARS! KNOWN FOR LYING,PROPAGANDA,HYPOCRICY, OIL-THIRSTY (one Nigeria), SWEARING... 'WALAHI TA LAHI'.. ALKWURA'...ETC.. KILLING, SUCKING THEIR VICTIMS YET SWEARING 'WALAHI TA LAHI'..GOD IS SEEING ,YOU PEOPLE WILL SURELY PAY DEARLY FOR ALL THE INNOCENT BIAFRAN BLOODS YOU HAVE SHED ... EVIL!